I've met some new neighbors this week. 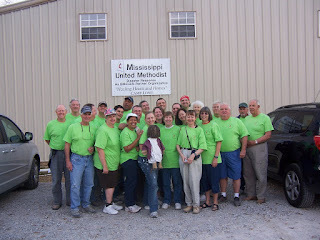 Some are from Sixes UMC in Canton, GA and some are from Centenary UMC in New Bern, NC. Others are Ms B and her daughter C. I also went to another work site today and met P. P is four years old. She told me she was from Disney World; she has three mommies, and is going to live in the house we were building (along with her grandmother and cousin). She also thought that Eric was superman and that Karen should stop napping in the church van. P has never known life without someone helping to rebuild her grandmother's house in her back yard. I've also gotten to know my Covenant group a LOT better this week. I know that Bert was uncomfortable that I fed him a hush puppy (even though he feeds people Communion monthly) but that he's getting over his food sharing phobia. I know that even though Keith's wife is nurse and childbirth coach, he doesn't want any descriptions or discussions of that topic. I know that Karen pretends to be Rosa but really is Ms. Daisy. And I confirmed that Joey still "ain't right" and will never be so. I didn't love these people last week. At least not the way I love them now. Some of them I didn't know and I'm not sure I would have loved them had I met them elsewhere but its too late now. I love them all. I'm doing what Jesus commanded me to do. I'm loving my neighbor. And it seems to me that I've discovered the best way to do that: Spend time together and laugh with each other. Life's short. Laughter makes it better. I haven't laughed so much on a church trip since I was a youth myself. I've come close on other trips with youth groups but I've always had responsibilities on those trips that distracted me from being able to laugh like I didn't care if I snorted, cried or passed gas while doing it. Thanks for such a great trip. Tomorrow Cindy, Karen and I head home. I'll let you know where we decide to stop for our field trip. Since YOU were a youth? Wow, that is a REALLY long time. But if it's any comfort, I think I've probably seen/heard you laughing like that since then at least once or twice. Its a little weird tonight without my "neighbors" of the past week but I am settling in here in PS. I am convinced that we can see Jesus in the people we encounter each day just as we did this week. One little green eyed girl tugs at my heart still.